Lily Tomlin was right. No matter how cynical you get, it’s impossible to keep up. Well. It has been a long time since I have posted anything political. And that is because frankly, it has been just too depressing a topic to really talk about lately, particularly when I try to put it all in historical perspective, which is what I do – after all, I am a historian. Not to be too dramatic, but I am really, really worried. Author Kelly and GeoffPosted on January 15, 2017 Tags 2016 election, crime, economy, elections, Hillary Clinton, history, HRC, it's the end of the world as we know it, my cat is smarter than Trump, politics, scary, this is why we can't have nice things, why good government is important1 Comment on Lily Tomlin was right. No matter how cynical you get, it’s impossible to keep up. Before I start talking about this particular Park Service ranger, I wanted to put it in context of my own relationship with the Park Service. I have been a fan of the Park Service for a very, very long time, at least since I was a boy. And for about a decade in my twenties and early thirties I was a volunteer for them at Stones River National Battlefield (in fact, you can occasionally still see a photo of me in my Union Army Civil War uniform in old park literature) in Murfreesboro, Tennessee. Occasionally I also did programs at other Civil War battlefields and sites. I miss it, frankly. Perhaps one day I will be in a position to do that sort of volunteer work again. Anyway, I still read a lot about things going on with the Park Service and I generally try to keep up with things going on with NPS. Like any organization, NPS has its celebrities. I had the privilege of meeting one of them, Civil War historian Ed Bearss, now retired, on several occasions. Ed is a warm, funny, extremely intelligent and knowledgeable guy with an incredible work ethic. And in that regard I am reminded of him by Betty Reid Soskin, another NPS celebrity. 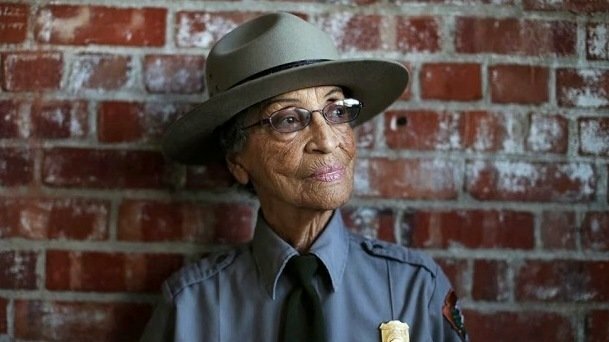 Betty is an extraordinary woman who also happens to be the oldest serving U.S. Park Service Ranger. She currently works at the Rosie the Riveter/World War II Home Front National Park in Richmond, California. In fact, Betty was absolutely instrumental in the creation of that historic park. And since she herself lived through the events preserved at the site, she has her own unique and fascinating stories to tell about that time in our history, including what it was like to be a woman of color in that segregated era. Last year she lit the National Christmas Tree and got to meet President Barack Obama, who gave her a special commemorative coin as a souvenir and gift. At the ceremony, she carried a photograph of her great-grandmother, who was born a slave in 1846 and died in 1948 at the age of 102. She carried the same photograph in her pocket in 2009, when she witnessed President Obama’s inauguration. AND… she’s an avid blogger. She’s that awesome. Well, something terrible happened to her this past Monday. She was beaten and robbed in her own home there in Richmond. And one of the things the a**hole thief took from her was the coin the President gave her. What kind of person does that? Who attacks a 94-year-old woman? How utterly depraved and/or desperate do you have to be to do that? God, I hope the police catch whoever did this to her. And the President has already said that he will replace the coin. Luckily, she seems to be recovering. But if you want to help her, the Rosie the Riveter Trust has organized a fund to help Betty out with her expenses while she recovers. And being the awesome person she is, Betty has already said that any excess funds will be used for a special documentary film history project about her life. Glad you are still with us, Betty, and from the East Coast, we all wish you the very best and hope you get well soon. We love you. Suddenly Cornwall is like some teenage kid who seriously pisses off his parents, and then suddenly doesn’t understand why they aren’t going to pay his college tuition anymore. You guys really didn’t think this through, did you? And you believed everything that the Leave Campaign told you? You know, that would be comical if it wasn’t so damn tragic, because there are going to be real consequences now, which will affect a lot of people’s lives. Fifty two years ago tonight, three young men were murdered by a group of white Mississippians in the Ku Klux Klan. Among the men complicit in this crime were members of the Neshoba County Sheriff’s office and the Philadelphia (Mississippi) Police Department. This was a mere six years before I was born. Many people of my generation are familiar with this event through the 1988 film Mississippi Burning, although the film doesn’t even cover everything that happened that awful summer. Kelly and I have both been shocked, horrified, and angry over what happened in Orlando. Truly, it is stunning to me that such a thing could happen, and even more stunning that we as a society could keep allowing these events to happen over and over and over again. Kelly vented a lot of anger in her earlier post, and there’s nothing more I can say about how we feel about this. But I want to be a little specific about some of the intellectually dishonest arguments being made by people around the country trying to explain all this away. I also want to talk about two people who were there, and who did everything they could to save people’s lives, and still couldn’t save everyone. They are still heroes, even if they themselves probably don’t feel that way, and probably wouldn’t use that word. Well. April 15th is another day that it seems like so many things happened throughout history. And for the most part, it seems like it has been a date on which a lot of truly tragic things happened. Honestly, I can only think of one really cool thing that happened on this date: it was the day that Jackie Robinson first debuted with the Brooklyn Dodgers in 1947. And as big a fan of baseball as I am, and as happy as I am about how far my favorite sport has come since that time, I can’t help but contrast that event with all the other terrible, tragic things that have happened on this day. Of course, the most immediate thing for me is that this is the 3rd anniversary of the Boston Marathon bombing. Hard to believe it has already been three years. But I am glad that Boston had really come together and bounced back.